Dimensional Shift and the New Earth- Has Jesus Christ Spoken? Bolstered by its military campaign in Syria, Russia is moving closer to securing a chance for Syrian President Bashar al-Assad to extend his rule in 2017 elections as the U.S. steps up efforts to end almost five years of civil war. Opposition in Washington is weakening against Russia’s insistence that Assad be allowed to compete in a presidential election after an 18-month transition period that starts next month, according to Russian and Western officials. For its part, Russia has agreed that the millions of Syrians who’ve fled their country can take part in the vote and is showing increasing flexibility on which Islamist rebel groups can join peace talks. President Vladimir Putin told U.S. Secretary of State John Kerry at a meeting in Moscow on Dec. 14 that Assad can’t be barred as a presidential candidate, and he would win if he runs, two people familiar with the matter said, speaking on condition of anonymity to discuss diplomatic matters. While Kerry didn’t agree, the U.S. is already pushing to set the terms of the 2017 ballot in ways that would reduce Assad’s chances of victory — contradicting the Obama administration’s repeated calls for the Syrian leader to leave office. More than 250,000 Syrians have died and millions of others have been forced from their homes in the conflict, sparking the biggest refugee crisis in Europe since World War II and spurring efforts to strike a compromise that would end the fighting. Russia’s intervention three months ago, which blunted the imminent threat of the collapse of Assad’s regime, according to officials in Moscow, has turned the tables in the Syrian leader’s favor and brought major powers to the negotiating table. 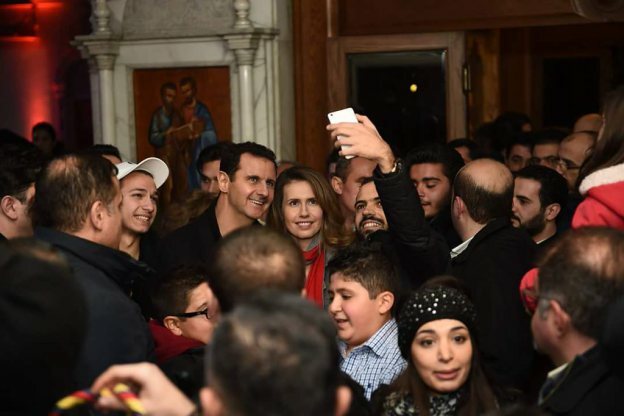 “Many Syrians will interpret a decision to allow Assad to run in upcoming elections as de facto international acceptance for him, regardless of U.S. intentions,” Emile Hokayem, senior fellow for Middle East security at the London-based International Institute for Strategic Studies, said by e-mail. The Syrian president won plebiscites unopposed twice with almost 100 percent of the vote. Last year, in the midst of civil war, he secured another seven-year term with 89 percent in a ballot condemned as illegitimate by Western and most Arab powers. Assad would probably engineer a “landslide” victory in any vote, said Peter Harling, senior Middle East and North Africa adviser at the International Crisis Group. The embattled leader now controls only a quarter of Syrian territory, though about 60 percent of the population. Kerry said Dec. 18 that the U.S. has abandoned its demand for Assad, an ally of Iran as well as Russia, to step down as a precondition for a peace deal. “We began to really come to the reality that this demand was in fact prolonging the war, creating greater agony and suffering, and not getting us anywhere in a stalemate,” he told reporters in New York. Although President Barack Obama said the same day that “Assad is going to have to leave for the country to stop the bloodletting,” he also has shown increasing flexibility about Syria’s future. Obama has said the nation’s military and government institutions should remain intact and that Assad’s Alawite minority should be protected from retribution. On his side, Putin acceded to the U.S. proposal to include the Syrian diaspora among the electorate, a Russian official said. A United Nations Security Council resolution unanimously approved on Dec. 18 stipulated that the 4.4 million refugees — out of the country’s pre-war population of 22 million — who have fled Syria will be eligible to vote and the ballot will be supervised by the UN. The Russian president also agreed to allow major Syrian armed opposition groups backed by Persian Gulf states and Turkey, such as the Army of Islam and Ahrar ash-Sham, to join the political process if they stop fighting. These Islamist groups, considered by Russia as terrorists alongside the al-Qaeda-affiliated al-Nusra Front and Islamic State, were both part of a Syrian opposition meeting hosted by Saudi Arabia in early December. UN-sponsored peace talks between the Syrian government and its opponents are due to start in Geneva on Jan. 25 over the formation of an interim body with full executive powers that would begin to function within six months. A year after that, the elections would be held following changes to the Syrian constitution. In parallel, the UN is to seek a cease-fire that would cover all armed groups, except for those considered terrorists. Saudi Arabia and other Sunni Gulf states, which along with Turkey have maintained calls for Assad’s ouster, are now willing for the Syrian leader to stay on throughout the 18-month transition period, said Abdulkhaleq Abdulla, a political analyst based in the United Arab Emirates. Turkish President Recep Tayyip Erdogan charged Assad’s government on Tuesday with “mercilessly” killing several hundred thousand people. He also criticized Russia for supporting him ahead of talks with Saudi King Salman in Riyadh. The Turkish state-run Anadolu news service said in a commentary on Dec. 22 that Assad has secured at least two more years in power after the passage of the UN resolution on Syria. As far as Assad’s candidacy in 2017 elections, “the Gulf states at this moment would say no for sure, but if there is a concession coming from everybody else, I don’t think there is a way for them to say no,” Abdulla said.